Life doesn't get much better than this! I've just spent three days in the Cotswolds looking at gardens, and even though the weather could have been better, I saw seven glorious gardens; attended a photography course with Clive Nichols, one of our leading UK garden photographers (more about that in a later post); and met some very talented and interesting head gardeners, so there'll be lots of posts from me in the next couple of weeks and many additions to my Garden Directory. On my way home today, I stopped at Sudeley Castle, which dates back to the 10th century. The Castle was built by Baron Sudeley in the 15th century, and although it has had many different residents since medieval times, and fallen under siege on many occasions, it was purchased by wealthy glove-making brothers - John and William Dent - in the middle of the 19th century and is still inhabited today by Dent descendents. 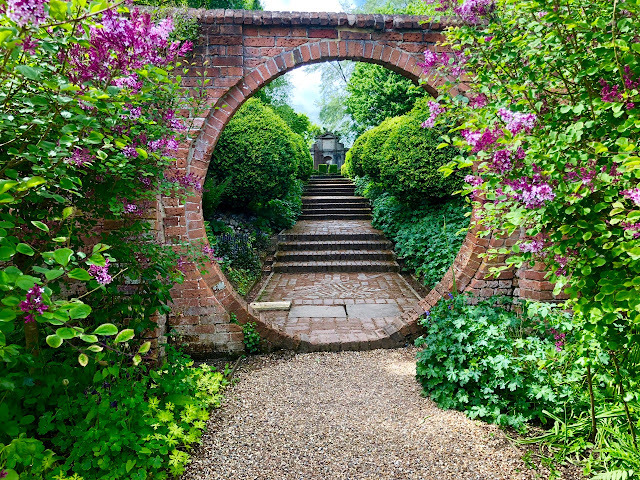 The Grade II listed gardens date back 300 years, and were restored and redesigned in the 19th century by Emma Dent. 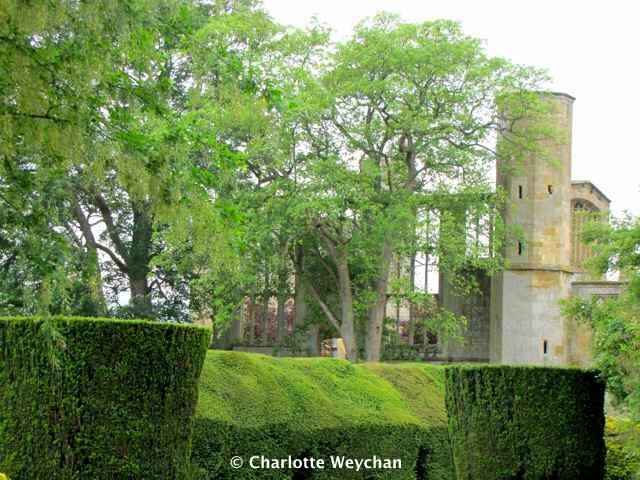 They include many different areas, but part of their charm is the backdrop of the ruined castle (above) and the Queen's Garden (top) is the centrepiece that makes a lasting impression on visitors, with its huge yew hedges and wonderful roses. The whole estate extends to more than 1,200 acres, with wonderful views over the Cotswold countryside, and there are ten different garden areas including a White Garden, Mulberry Garden, and a Secret Garden, designed by Rosemary Verey to celebrate the marriage of the current castle residents, Lord and Lady Ashcombe in 1979. 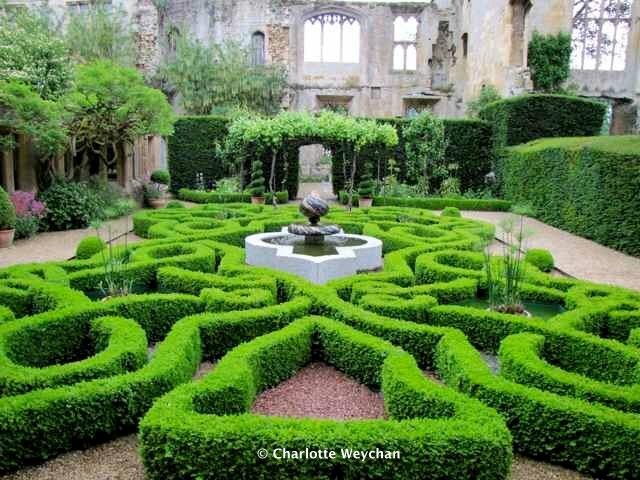 The gardens at Sudeley are really magnificent, but one of my favourite areas is the wonderful Knot Garden (above) with a Moorish mosaic fountain in the centre, which was created in 1995 and incorporates a design taken from a dress pattern worn by Elizabeth I in a portrait that hangs in the castle. 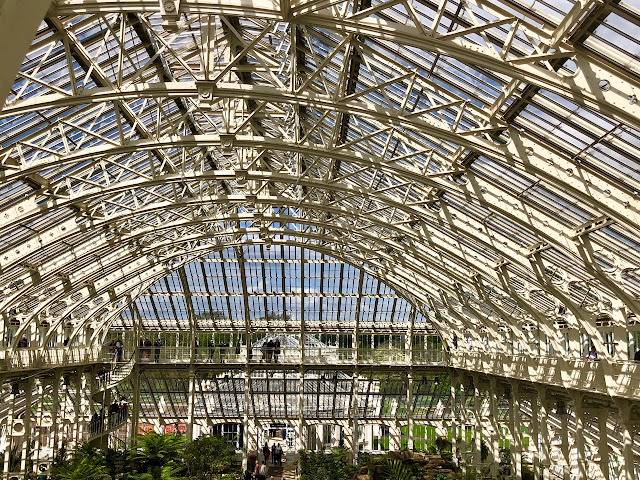 It is hidden away behind the Queen's Garden and has an adjacent exhibition terrace showing how it was conceived and designed. 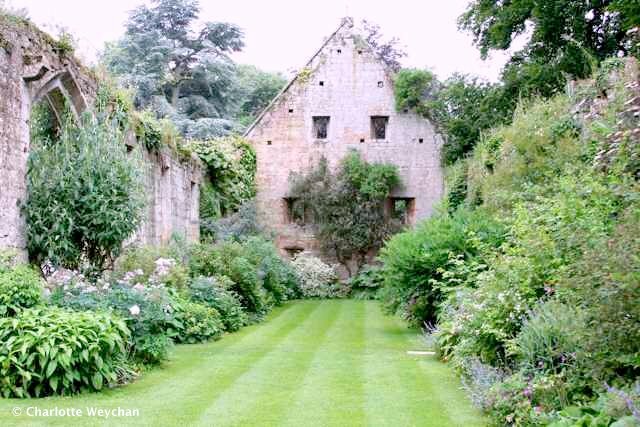 Equally lovely is the garden within the ruined tithe barn (above) with its glorious borders, and this stands next to a pond filled with koi carp. There's a lot to see at Sudeley so you will need several hours to fully appreciate the gardens. And then of course, there's the castle, which you can see on a guided tour. But it does get crowded, so arrive early to get ahead of the coach parties! I know Sudeley and it's glorious. 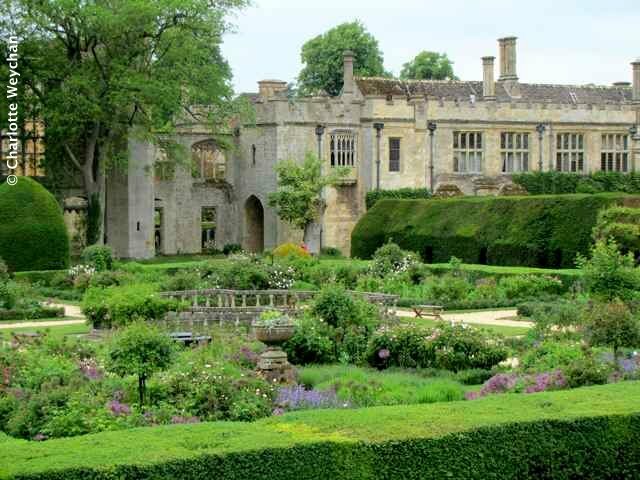 Love Sudeley Castle have sat and painted there many times.